But Peacham also goes on to assess the effects of such rhetoric. Of paregmenon, he wrote: “The use hereof is twofold, to delight the eare by the derived sound, and to move the mind with a consideration of the nigh affinitie and concord of the matter.” This could serve as a description of the manifold pleasures that Jo Kondo’s music makes available to its listeners. Kondo has pursued a similar compositional art of juxtaposition—the “affinitie and concord” of sounds placed aside one another—as a means to capture in music the effect of an apparently “flat surface” that is nonetheless perceptually active. This creates what Kondo refers to, relishing the apparent contradiction, as “dynamic stasis.” Surveying the scarred landscape of Dartmoor, Kondo experienced a similar assemblage in the visual domain, a “patchwork of green rocks and reddish earth, none of them being confined to the foreground or background”.<3> There is no obvious path through such a landscape; rather we might just discern a way forwards, driven by subtle shifts in the local equilibrium suggested to us by the placement of similar materials—by attention, that is, to their common derivation. 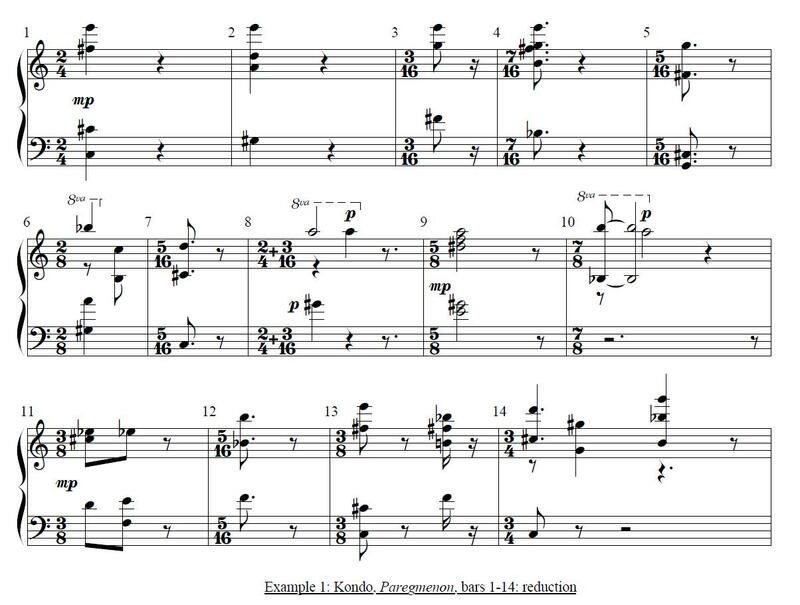 In choosing Paregmenon as the title of his 2011 composition for combined string and percussion quartets, Kondo thus gave expression to a distinctive aesthetic preoccupation.<4> The title seems relevant in another way, in relation to the composer’s avowed interest in Hellenistic thought, and even in connection to his self-identification with a “Western music world” as opposed to a specifically Japanese one.<5> For his engagement with the former sometimes reveals itself at an angle, and paregmenon enters even at this level; several of the descriptors that Kondo applies to his own music themselves appear to be rooted in yet subtly branch off from familiar Western music theoretical concepts, including as we shall see such fundamental ideas as line and form. In this terrain of constant change, what does it mean for a sonority to recur? 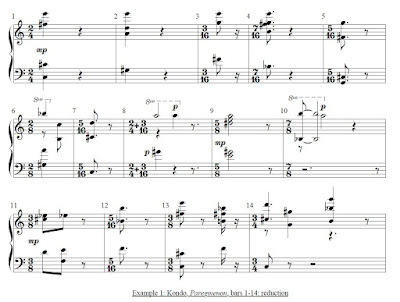 Indeed, the first sonority reappears, with only slight adjustment, on the downbeat of measure 13. Similar repetitions are seeded into the fabric of the composition, as they are in Kondo’s music in general; the act of juxtaposition can lead us in many directions, including apparently back to where we started.<8> Such events ward off a hearing which pays no heed to memory. Kondo’s music requires us to be alert to—and wary of—the constant possibility of renewing our path through recollection of its previous states. Indeed, recollection is as much a part of the experience of paregmenon as derivation. While listening, we are navigating a middle course between the experience of literal repetition and variation, what Kondo refers to as “pseudo-repetition.”<9> This pseudo-repetition suggests a particular approach to the reconstructive capacity of memory that aligns with the occasionally more humbling aspects of the experience: Kondo’s paregemenons destabilize the object one might remember. Certainty is always in question, and the possibility of error is constantly before us, just as it is in the practice of real memory. Despite its richly connected surface, this opening music moves through a dizzying array of close or distant sonorities with no regular pulse beyond a constant pushing and pulling of chordal interactions. There is no single organizing reference, no textural center. Borrowing a term from William Caplin, we can refer to this music as manifesting ‘loose’ organization. His term becomes even more useful when we discover, later in the composition, the music suddenly aligning into a contrasting, ‘tight-knit’ pattern that features a dialogue in the style of a frieze pattern between alternating marimba duo and string quartet, about an insistent, refrain-like figure in the vibraphone.<10> The second such passage is shown on example 3. 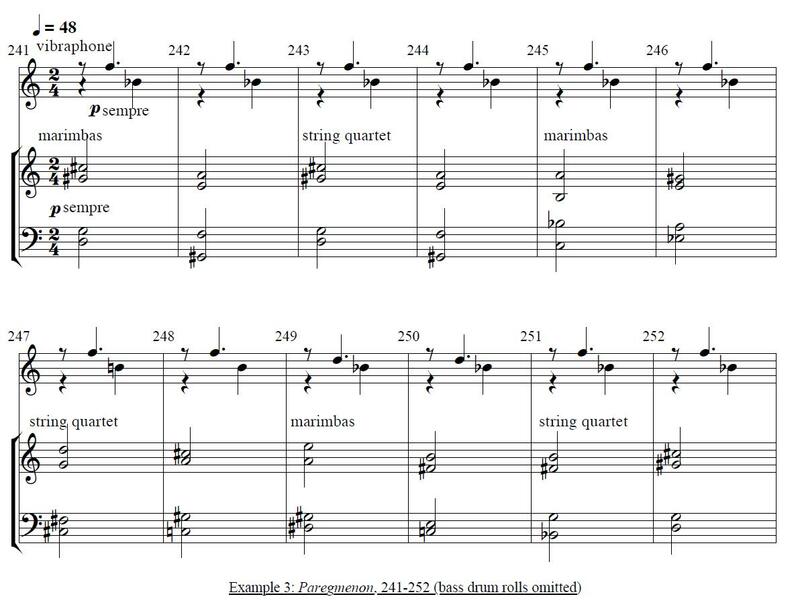 The intervals in the refrain seem responsive to the intervallic content of the duo and quartet, suggesting that a “root interval” may be derived from a process of distillation. At core, such a context allows us yet another format in which to experience the affinities at the heart of paregmenon; the anxieties of an unfamiliar terrain have given way to a sense of wonder at its fragile beauty. <2> Peacham sources the Biblical example from Isaiah, although in this paraphrased form it appears in 1 Corinthians. The Shakespeare example comes from Jean-Marie Maguin’s useful catalogue, “Words as the Measure of Measure for Measure”: Shakespeare’s Use of Rhetoric in the Play”, Sillages critiques 15 (2013), at http://journals.openedition.org/sillagescritiques/2618?gathStatIcon=true&lang=en (accessed January 10, 2018). <3> Kondo, liner notes for CD ALCD-57 (2000); the disc contains his Trio (moor), from 1982. For the landscape itself, see for instance the second picture at https://historicengland.org.uk/research/research-results/recent-research-results/south-west/dartmoor-nmp/ (accessed January 10, 2018). <4> The work was premiered by the Quatuor Bozzini and Slagwerk Den Haag in November 2011. Unfortunately, there is no commercial recording available. <5> Personal communication; see also the composer’s dialogue with Stefan van Eycken that followed the premiere of Paregmenon: https://slagwerkdenhaag.wordpress.com/2012/01/04/interview-jo-kondo-stefan-van-eycken/ at 4:27 (accessed January 11, 2018). This is not a negative assessment by any means; he acknowledges that being Japanese undoubtedly affects his musical voice, but he has chosen to leave this unanalyzed. For an example of a recent attempt to link Kondo’s musical personality to specifically Japanese concepts, see John Liberatore, “Mutual Relationships: an Aesthetic Analysis of Jo Kondo’s High Window”, DMA dissertation, Eastman (2014): 24-28. <6> Dialogue with van Eycken, at 2:14. In music theory, “root intervals” usually refers to the intervals between the roots of successive triads, a topic studied rigorously in contemporary neo-Riemannian theory; Kondo’s use is unrelated. 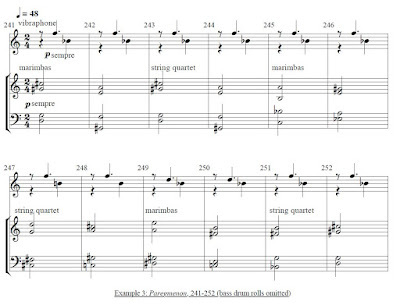 <7> An excellent introduction to “pseudo-polyphony” can be found in Liberatore, op. cit., 8-11. 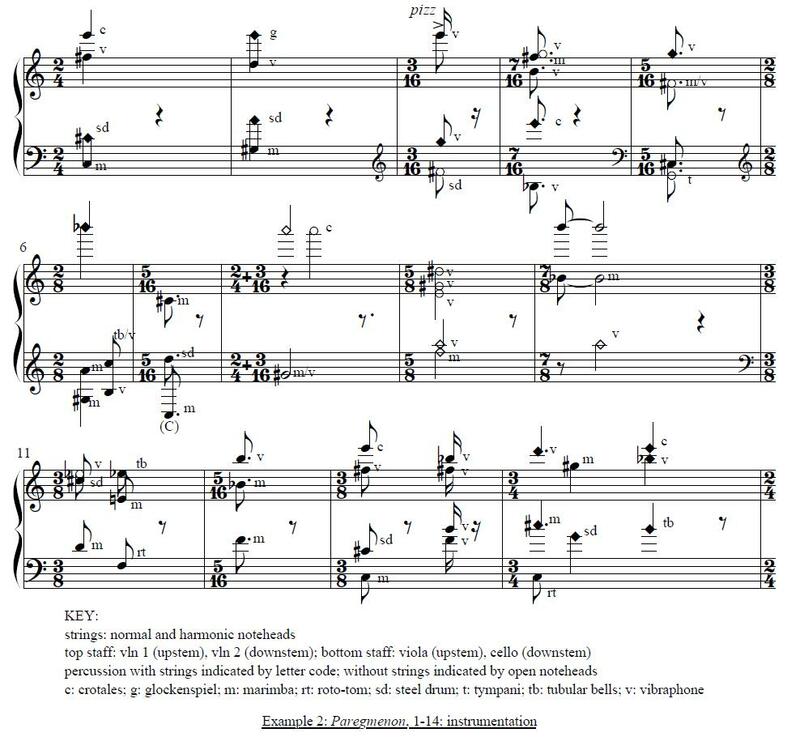 <8> A reading of Kondo’s music particularly sensitive to the effects of different kinds of repetition is Paul Zukofsky’s essay, “Jo Kondo’s Still Life”, available at http://www.musicalobservations.com/publications/jo_kondos_still_life/ (accessed March 3, 2018). 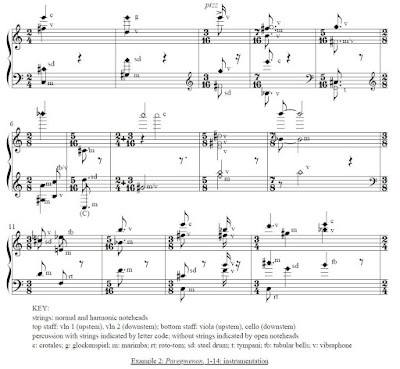 <9> Kondo, “The Art of Being Ambiguous: From Listening to Composing,” Contemporary Music Review 2: 2 (1988), 7-29. The definition and related discussion are on pages 25-26. <10> This alignment is all the more striking following some extremely fast music, in Kondo’s sen no ongaku [linear music] style. I borrow the ‘loose’ vs. ‘tight-knit’ distinction from Caplin, Classical Form: A Theory of Formal Functions for the Instrumental Music of Haydn, Mozart, and Beethoven (New York: Oxford University Press, 1998). Anton Vishio is an Assistant Professor at William Paterson University in Wayne, NJ, where he teaches music theory and composition. His research involves analysis of a variety of composers of late 20th century music; recent papers have explored works by George Lewis, Priaulx Rainier, Brian Cherney, and Milton Babbitt. Musicology Now is pleased to welcome Christopher J. Smith to our editorial team. Smith is Professor, Chair of Musicology, and director of the Vernacular Music Center at the Texas Tech University School of Music. 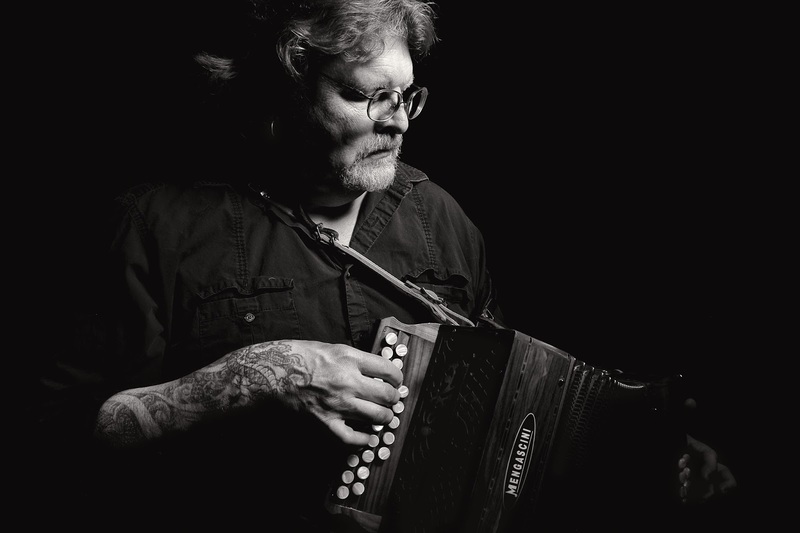 His research interests are in African-American Music, 20th Century Music, Irish traditional music and other vernaculars, improvisation, music and politics, and historical performance. He records and tours with Altramar medieval music ensemble, the Irish traditional band Last Night’s Fun, the Juke Band (pre-WWII blues and jazz), and the pan-European Balfolk group Rattleskull. His full-length theatrical dance show Dancing at the Crossroads premiered in February 2013 and his scholarly monograph, The Creolization of American Culture: William Sidney Mount and the Roots of Blackface Minstrelsy (Illinois), was the winner of the Irving Lowens award from the Society for American Music in 2013. Smith's new monograph for Illinois is Movement Revolutions: Bodies, Spaces, and Noise in American Cultural History (2019). He is the Executive Editor of the peer-reviewed Journal of the Vernacular Music Center, directs the TTU Celtic Ensemble, and arranges for and conducts the Elegant Savages Orchestra symphonic folk group at Texas Tech. He is a former nightclub bouncer, framing carpenter, lobster fisherman, and oil-rig roughneck, and a published poet.